When the economy goes into a recession, many economic variables are affected. This article, written during the recession of 2001, gives some examples. Economists pore over scores of numbers every week, trying to sense when the recession is over. But quirky indicators and gut instinct might be almost as helpful-maybe even more so. Is your dentist busy? Dentists say.people put off appointments when times turn tough, then reschedule when the economy improves. How far away do you have to park when you go to the mall? Fewer shoppers equal more parking spaces. If you drive to work, has your commute time gotten shorter or longer? Economist Michael Evans says a colleague with a pipeline into the garbage business swears by his own homegrown Chicago Trash index. Collections plunged after the Sept. 11 terror attacks, rebounded in October but then fell off again in mid November.Trash is a pretty good indicator of what people are buying,says Evans, an economist with Evans Carrol & Associates. They’ve got to throw out the wrappings. What’s actually happening is often clear .only in hindsight. That’s one reason the National Bureau of Economic Research waited until November to declare that a recession began last March-and why it took them until December 1992 to declare that the last recession had ended more than a year earlier, in March 1991. “The data can fail you, says Allen Sinai, chief economist for Decision Economics. Sinai cautions that if numbers appear to be going up (or down), it’s best to wait to see what happens over two or three. months before drawing a conclusion-something hair-trigger financial markets routinely don’t do. We have lots of false predictions of recoveries by (stock} markets that don’t happen,he says. Like a lot of economists, Sinai leavens the numbers with informal observations. These.days, he’s paying particular attention to what business executives say at meetings and cocktail parties because their mood-and their plans for investing and hiring-are key to a comeback. Even the Federal Reserve, whose more than 200 economists monitor about every piece of the economy that an be measured, make room for anecdotes. Two weeks before every policy meeting, the Fed publishes its beige a survey based on off-the-record conversations between officials at the Fed’s 12 regional banks . The reports are peppered with quotes from unnamed business people (Everybody. decided again,someone told the Richmond Fed Bank last month) and the occasional odd detail that down the Fed inquisitors sometimes drill. Last March, the Dallas Fed Bank reported gorillas for Valentine’s Day. 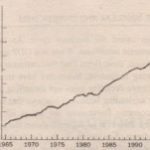 Consider again the impact of money on the economy: Most economists believe that, beyond a period of several years, changes in the money supply affect prices and other nominal variables but do not affect real GDp, unemployment, or other real variables–just as classical theory says. When studying year-to-year changes in the economy, however, the assumption of monetary neutrality is no longer appropriate. In the short run, real and nominal variables are highly intertwined, and changes in the money supply can temporarily push real GDP away from its long-run trend. Even the classical economists themselves, such as David Hume, realized that classical economic theory did not hold in the short run. From his vantage point in 18th-century England, Hume observed that when the money supply expanded after gold discoveries, it took some time for prices to rise, and in the meantime, the economy enjoyed higher employment and production. To understand how the economy works in the short run, we need a new model. This new model can be built using many of the tools we developed in previous chapters, but it must abandon the classic and the neutrality of money. We can no longer separate our analysis of real variables such as output and employment from our analysis of nominal variable such as money and the price level. Our new model focuses on how real and nominal variables interact.